Another spring cold front day so it was another day to chase white bass on Bull Shoals. My wife, daughter and father-in-law went as far back as they could get his boat in Shoal Creek. There were only a few other boats at the back of Shoal, the rest of the crowd was at the back of Big Creek, which is accessible by both boat and car. The fish really did not start biting until 2 p.m. There really is no science to catching these fish this time of year. They are stacked at the back of flowing creeks…getting ready to spawn. Everyone was catching fish, but eventually, my daughter got tired of casting. She was content on letting her poppy cast and hook the fish so she could then take the rod and reel in the fish. Poppy took the fish off the hook and she would run it back to the live well. By the time she came back to the front of the boat, poppy had another fish on the line. While the few other boats were in what they thought was the back of the creek, Tom found the creek channel and went up another 100 yards or so, into about two feet of water. That is where the majority of the fish were located. The lure of choice was a white Bang Tail…1/2 oz. They had a great day on the water and landed 38 fish total. They missed a bunch as well. 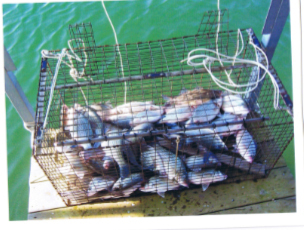 Brenna caught 15, Tom caught 15 and Dawn caught eight. That’s a pretty good day on the water. 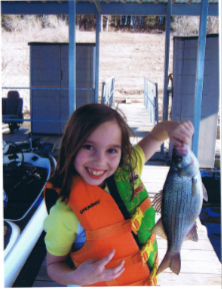 As for me, I had the opportunity to take my boy fishing…just us…in my boat. This was the first time we have done this, and it was truly a fantastic trip. We only fished for about two hours. Colin really got into casting his rod and did so for about 20 minutes. I was smart enough to take his Nintendo DS and some food and drink to keep him busy while I fished from the front of the boat. Truly a great day on the water, and one that I will never forget. Fish or no fish. Have you ever gone to your favorite tackle shop in search for a particular bait only to find out that they are sold out? If that lure is sold out, then chances are, everyone who purchased that bait is throwing it on the nearest lake. Fish get familiar with lures that are constantly barraging them. After a while, they equate that bait with a steel hook in their head…and they quit hitting it altogether. One way fishermen are increasing their chances at landing fish is to custom paint their own lures. Custom painting lures is a great way to set your baits above the rest and show the fish something a bit different than what everyone else is throwing. Painting your own baits is fairly simple. The items you need to get started are a small air compressor, an airbrush, paint and clear coat to protect the paint job. Small air compressors are not that expensive and can be purchased from any hardware store like Home Depot or Lowe’s. You can also use them for other jobs around the house like topping off the tires on your truck, cleaning off your work bench or keeping the kid’s soccer ball full. 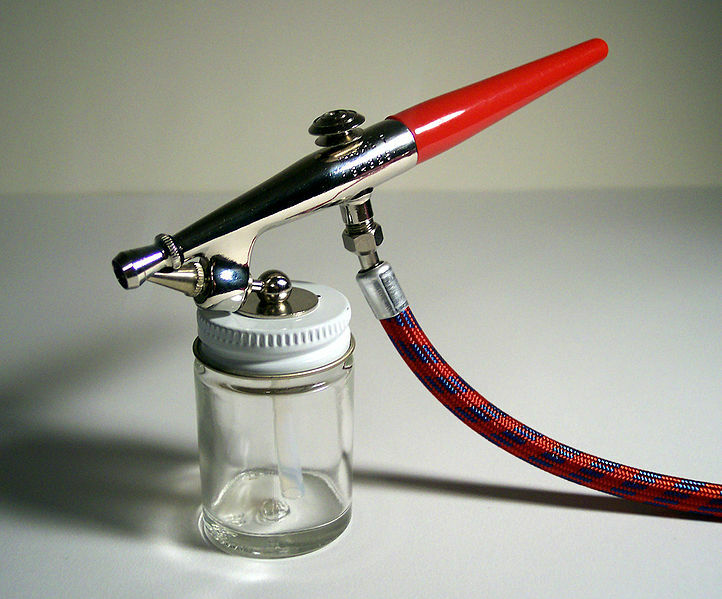 The simplest airbrushes work with a single action mechanism where the depression of a single “trigger” results in paint and air flowing into the airbrush body and the atomized paint being expelled onto the target surface. Cheaper airbrushes and spray guns tend to be of this type. Dual action or double action airbrushes separate the function for air and paint flow so that the user can control the volume of airflow and the concentration of paintflow through two independent mechanisms. This allows for greater control and a wider variety of artistic effects. This type of airbrush is more complicated in design than single action airbrushes which tend to be reflected in its cost. Buying paint is the fun part. You can find paint at hobby shops or online. These colors you purchase should be the colors that reflect the food supply in your lake (if it’s a clear-water situation) or bold colors like orange, chartreuse and blue if you are in stained- or muddy-water situations. Prepping the bait consists of removing the existing paint with sand paper, paint thinner or with a sand-blasting machine. Make sure all the original paint is gone and that you are starting with a smooth, clean surface. Then remove the hooks and O-rings and tape the bill with masking tape to keep the bill clean and free of over spray. The key to painting lures is to start with spraying small amounts of paint a time AND to keep your hand moving across the bait. If you stop, your spray will not be evenly distributed across the length of the lure. Perhaps the most important part of the entire process is the clear coat. This coat seals and protects the paint job and gives your bait a coat of armor. When you are done painting the lure, hang it with a piece of wire for at least a day until the clear coat does not feel tacky. 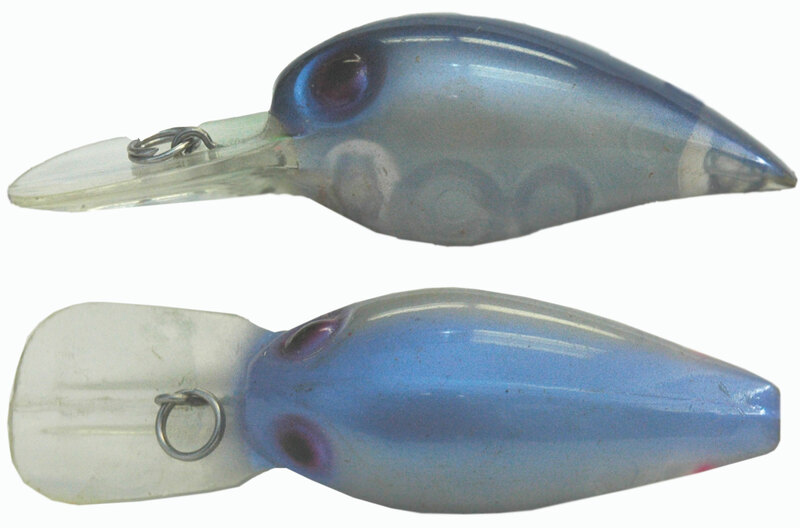 For more information about custom painted baits, drop me a comment on this blog.